I really busted it out this week on my sweater with bows! The upper body went really fast with lots of decreases. 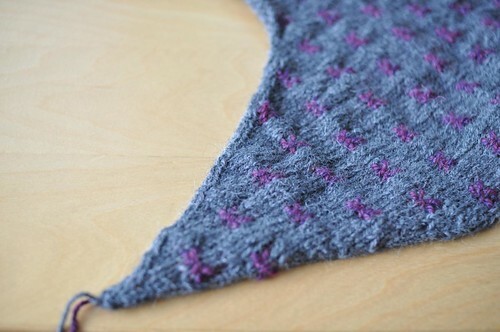 Seaming raglans is really easy and satisfying. Even the button band didn’t take too long. Just needs some buttons and a good blocking. The temperature’s dropped quite a bit today, so I’m rather eager to have this one ready to wear! That looks really cute! I really enjoy how the color seems to go from light blue to heather grey in your pictures- which one is truest to the ACTUAL color? It looks really nice thus far. Look forward to seeing you wearing it. That is really beautiful. I’m amazed at your productivity. It’s like a magic trick. 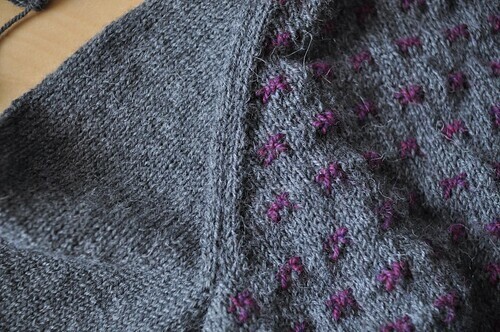 Now you see me frogging, now you see a finished sweater. It’s beautiful! Here too in Mtl the weather went down a few degrees since yesterday, brrrrr…. Yeah to warm sweaters! The little bows are so cute! 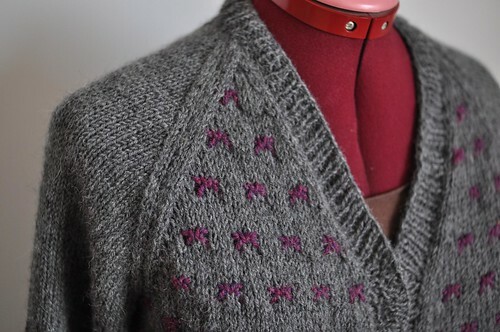 Impressed (yet again) at how fast you can finish a sweater. I look forward to seeing it modeled!